What Are Octogenarians and Nonagenarians Reading? In this month’s Readers Write column, we set out to discover what book reading is like for seniors as they near their 80s or 90s. How have their lives been influenced by reading? How do they choose what to read next? Here’s what some of the older and wiser readers in our lives shared about what’s on their reading lists. Bob Lessard, 82, was a Minnesota state senator for 26 years. He twice successfully championed amendments to the Minnesota state constitution, chaired the Environment and Natural Resources Committee for many years, and now serves as a community outreach liaison for the DNR. Widely known by leaders in all political parties, Bob attributes much of his success to his love of reading about history and politics. “My history of reading history has no doubt affected my decision-making process,” he says. Bob says he does enjoy a good mystery once in a while, noting that he’s read all the Sherlock Holmes books. But history is his true passion. Alma, 72, writes: “I can’t remember ever having a list of books I wanted to read. I usually read anything that is available. Since I read six or seven books a month, I look for an author who has a lot of books on the library shelf. I take out one, and if I like it, I read the whole series. I also get ideas from the newspaper, Readers Digest, and Good Housekeeping. My favorite authors are Nicholas Sparks, Catherine Anderson, Jodi Picoult, Kristin Hannah, and Dorothy Garlock. Rosemary, 84, shares her list of books she plans to read: The Light Between the Oceans, Olive Kitteridge, The Witch’s Daughter (all recommended by someone she knows). Books that have made a difference in her life include: And The Mountains Echoed, The Memory Keeper’s Daughter (very good, she says). The most recent book she and her friends have talked about: Heaven is For Real. 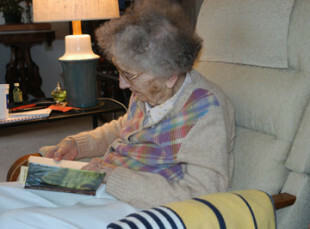 Photo: When Dorothy Stiles was 98, she chose to read Perch, Mrs. Sackets, and Crow’s Nest, because one of the main characters, Mrs. Sackets, was based on her life. There are all sorts of reasons we choose the books we want to read. What’s on your reading list? What do you think your list will look like when you are 80 or 90?